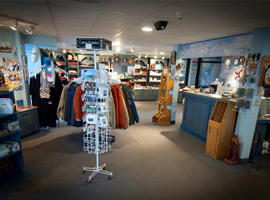 The North Cape Wind Energy Interpretive Centre also houses the North Cape Gift Shop and welcome center, offering souvenirs, local crafts, and information. Many of the products are locally handcrafted such as quilts, ceramics, photo memories and more. Retailers may be interested in wholesale purchases from the Holiday Island Productions website (online purchase available). SeaSplash products are also sold at the gift shop – a special line of bath and body are produced locally and contain Irish moss and its moisturizing properties. Irish moss is a plant that grows on the ocean floor and is harvested off the coast of North Cape. 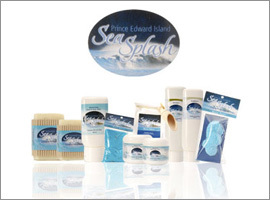 SeaSplash products including soaps, shampoos, and body lotions, are also available for purchase at Tignish Treasures in Tignish, and online. Ask about the “Tip to Tip” program referencing the eastern and western extremities of PEI. Visit both the East Point Lighthouse Craft Shop and the North Cape Wind Energy Interpretive Centre and receive a “Tip-to-Tip” ribbon at one and a certificate at the other end.